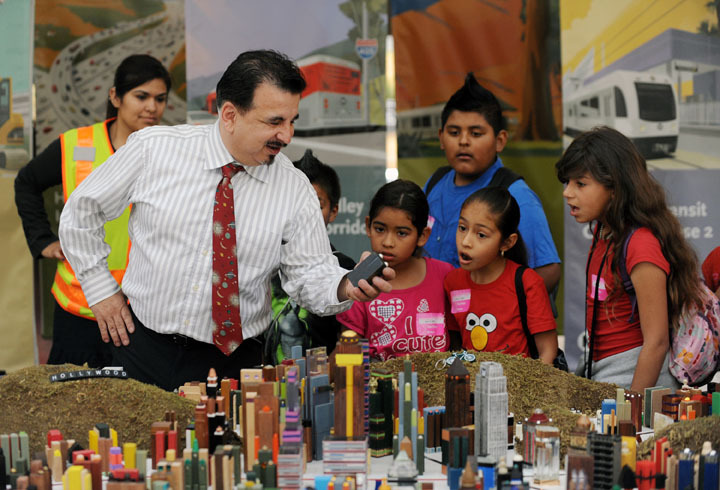 Metro planner James Rojas explains a transportation model of Los Angeles at the Dump the Pump event at Union Station. Photo by Juan Ocampo. If you haven’t Dumped the Pump yet there’s still time — the day is only half done. Metro and several public officials held a news conference at Union Station this morning to encourage residents of the area to take mass transit and/or to carpool and vanpool. 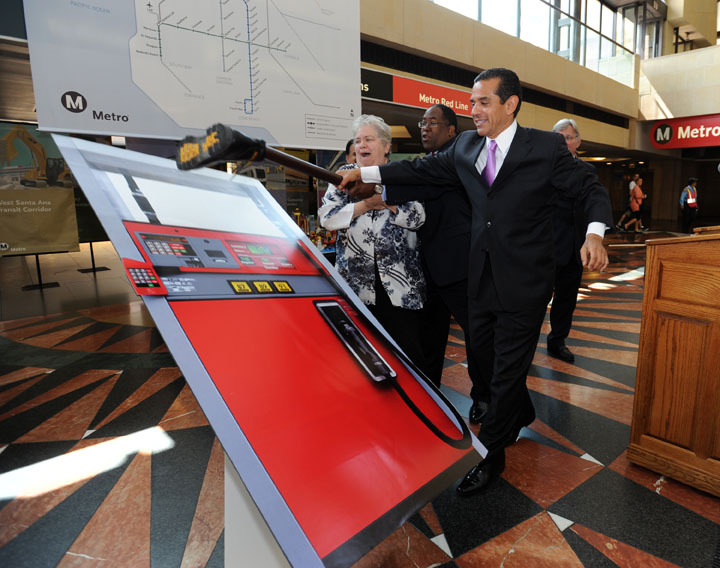 Mayor Antonio Villaraigosa and Metro officials today marked national Dump the Pump day with a twist. They encouraged motorists to park their cars and trucks and take public transit or join a carpool or vanpool. But they also used the occasion to share how Los Angeles is being transformed from the car capital of the world to the transit capital. James Rojas shows L.A. Mayor Antonio Villaraigosa around the town. Photo by Juan Ocampo. “In the midst of the Great Recession when so many people are struggling to make ends meet, it pays to park your car and take Metro at least once a week or join a carpool or vanpool,” said Pam O’Connor, Santa Monica Mayor Pro Tem and Council member and a Metro director. “You can save $10,000 a year through ridesharing compared to driving solo, and Metro continues to offer new options like the Line 733 Metro Rapid on Venice Boulevard that debuts Sunday, June 27. The future looks even brighter,” O’Connor noted. Mayor Villaraigosa gives the boot to the pump. Joining him were two other members of the Metro Board of Directors -- Pam O'Connor and Mark Ridley-Thomas. Photo by Juan Ocampo. She noted the dozen major new transportation projects funded by Measure R that are under construction or planned will, literally, change the urban landscape in Los Angeles County. 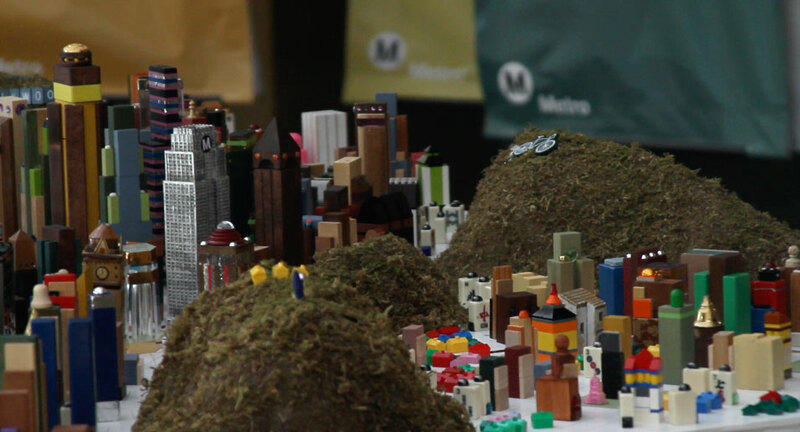 A closer look at James Rojas' model of Los Angeles that shows various rail lines. Photo by Fred Camino. Metro Rail will mark its 20th anniversary in July. It is already among the 10 largest rail systems in the United States carrying more than 300,000 weekday boarding passenegers on 79 miles of track It will almost double in size as light rail lines are extended through the San Gabriel Valley and Crenshaw corridor, through the South Bay, Eastside and Westside. There also will be a downtown regional connector linking the Metro Blue, Gold and Expo lines, an extension of the Metro Purple Line subway to Westwood, plus a rapid transit option that will connect the San Fernando Valley and Westside through the Sepulveda Pass along the I-405 freeway corridor, an extension of the Metro Orange Line busway to Chatsworth, Metrolink and bus service improvements. (go to www.metro.net/projects/measurer/ for details.) Plans for high speed rail also are in the works. O’Connor noted this huge investment in transportation infrastructure will give developers a powerful incentive to concentrate new housing and commercial development around the rail and Metro Orange Line stations. In November 2008 voters approved Measure R, a half cent sales tax in Los Angeles County, that will pay for these transportation projects over 30 years. However, Metro is urging the Obama Administration and Congress to approve a 30/10 plan and let Metro leverage Measure R monies with advance federal low interest loans or loan guarantees to complete a dozen Measure R projects within a decade. Mayor Villaraigosa noted this acceleration would boost the region’s construction industry by generating 160,000 new jobs while eliminating $3.4 billion in project construction costs over the long term. Together the 12 projects will reduce vehicle pollution emissions by 568,000 pounds annually, save 10.3 million gallons of gasoline per year and reduce traffic congestion by eliminating 208 million vehicle miles from roadways. U.S. Transportation Secretary Ray LaHood has pledged support for Measure 30/10 and Senator Barbara Boxer and other legislators are mobilizing Congressional support for 30/10, which also is supported by the U.S. Conference of Mayors. Go to http://www.metro.net/projects/30-10/ for more information. National Dump the Pump Day is sponsored by the American Public Transportation Association (APTA), a non-profit association of more than 1,600 member organizations, including almost 400 public transit agencies.